Prehnite is a silicate which is usually light green to yellow in colour. It is the first mineral to be named after someone; Colenel Hendrik Von Prehn. Prehnite rarely forms distinct crystals, usually it forms as stalactites or botroidals. 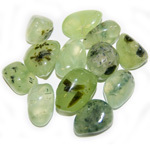 As a healing stone, prehnite strengthens the life force and generally increases and stimulates energy flow. It aids spiritual communication through meditation or visualization, and is a powerful dream stone. It is also helpful in the healing of gout, anemia, and kidney problems.